Finally, after a mysterious delay of seven months, Government has started some serious effort to deal with Taliban. PML-N government has constituted a four member committee to negotiate with Taliban. The most vocal and visible member of the said committee, Irfan Siddiqui is special assistant to Prime Minister. He got this position as a reward for writing one-sided columns in support of the ruling party. In response Taliban has also nominated a five member committee which will act as a bridge between government and Taliban. Taliban has nominated Imran Khan as one of the members of their committee. This is also a type of reward in form of show of faith in Imran Khan by Taliban, due to his unequivocal support for Taliban. So, it has been decided that government wants to give peace a chance. That’s why it has decided to first negotiate with the murders of 35,000 Pakistanis. That’s really good but will these negotiations ever materialize? Or do Taliban really want to negotiate and give up their arms? These are the tough questions and no one knows the answers with certainty. The committee formed by government comprises of pro-Taliban members. Prime minister deliberately chose these persons to give a message to Taliban that He is sincere in his effort. This has resulted in a unique situation as now supporters of Taliban will negotiate with Taliban on behalf of government. This is a win-win situation for Taliban because government members are ardent supporters of Taliban’s cause. If negotiations are successful then Taliban will get a good bargain and if not successful then their will not be a national consensus against them. Either way, it’s Taliban who will be the beneficiary of this so-called peace process. PML-N government has decided to go for the negotiations rather than operation, when most of members of PML-N supported operation in a recent parliamentary meeting. The reasons for this choice are not too intricate. There is pressure from the main opposition party I.e. PTI, which is advocating and supporting Taliban passionately. Due to their blind support of Taliban they have earned the title of Political wing of Taliban from certain quarters of the society which are clear on the issue of Taliban than PTI. Secondly, there are supporters of Taliban in every walk of life and every department of government including Armed forces. Such people have developed false ideals that Taliban will bring a positive change to the country by implementing Shariah. Moreover, the need to tackle Taliban grew stringer when Taliban carried out a bomb blast in Punjab. PML-N wants to prevent Punjab from terrorist related activity at any cost. In past PML-N government has begged Taliban not to hit Punjab. Why Taliban has so much support in Pakistan that even prime minister was compelled to choose the route of negotiations? Different people and groups support Taliban for different reasons. 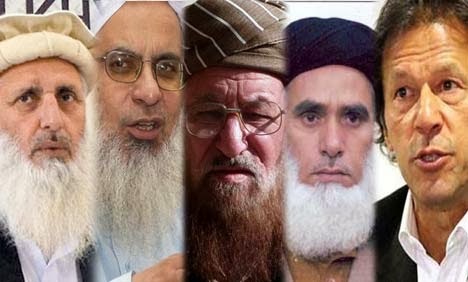 Religious political parties such as JUI and JI support them to play the Islamic card for political gains; PTI supports them to prevent itself from the terrorist attacks of Taliban. Imran Khan has even said in his interviews that He supports Taliban to prevent his party members from dying at the hands of Taliban. There is also a section of the society which, due to their ignorance, sincerely believes that Taliban are on a noble mission and therefore one must support them. Such people can be found in abundance everywhere including the social media. The crux of the matter is that will the Taliban drop their weapons as a result of negations? The answer is a big NO, Taliban thrive on violence and without it there goal of existence cease to exist. Taliban are not on some holy mission, they want to acquire power by raising the slogans of Jihad and Shariah and in the process, manage to delude common people in captivating them about their sincerity. People are emotional about religion and Taliban exploit this weakness pretty well. The power that Taliban have gained as a result of its terror campaign in the last decade will not be give-up so easily. Before joining the ranks of Taliban or its affiliates Hakeemullah Mehsud was a fruit seller in Islamabad, Fazullah was a chair lift operator in Swat and infamous Mangal Bagh was a motor mechanic. So the Taliban commanders who have achieved prominence, money and power due to militancy will never lay their weapons and embrace the writ of the state. If Taliban are not willing to negotiate then what should be done? What’s the solution? Negotiations should be carried out so that Taliban can be exposed that they don’t want any peaceful settlement. Negotiations should be conducted in a way that Taliban are treated as an enemy force not as our own people. One should not make any mistake about it that these negotiations will fail because state can’t surrender to Taliban even if people like Imran Khan wish so. After the failure of the negotiations, Taliban will intensify their terror camping and government will be forced to mount a military operation. The military operation will be futile if it’s not backed out by a political strategy. In the presence of Taliban apologists in ranks of every party makes a unanimous political strategy against Taliban a far cry. Negotiations or military operation, the situations is bleak when it comes to dealing with terrorists.